The Cummins six-cyliner in-line marine diesel is a common engine on commercial fishing boats from Seattles classic long line halibut schooners to Gulf of Mexico Shrimpers. In southern California the 85 by 24 ft Royal Star, a sport fishing boat out of San Diego, has run up a lot of hours on a pair of these engines. Extended fishing trips have routinely taken the Royal Star well into Mexican waters and, on occasion further south in Central America. The boat was built by Ted Dunn on a Poole hull into which he incorporated many of his design concepts. These included, in addition to the original Cummins engines, integral, structural and mechanical features in a manner that separates the Royal Star from several similar vessels operating in southern California. Since her launch at Chula Vista in 1986, the Royal Star has maintained a 300-day per year operating schedule. This schedule averages 4000 to 4500 hours of annual machinery use involving a diverse, heavy duty operating schedule in demanding conditions with zero down time from July through December, explained Tim Ekstrom, who owns the vessel with Randy Toussaint. 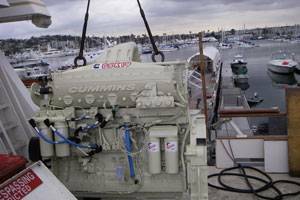 The decision was made to repower with modern environmentally friendly Tier 2 certified engines from Cummins Marine, because the original engines had proved so reliable. The electronic controlled QSK19-M with its common rail fuel system was selected. Based on the same 19-liter displacement block as the original engines, the QSK19-M has been upgraded to maximize the efficiency of the fuel burn in order to meet the stringent requirements of the US Environmental Protection Agency. The two engines installed in the Royal Star have a continuous duty rating of 500 hp each to give her a combined 1000 hp turning the two 40 by 38-inch props through Twin Disc MG518 gears. For comfortable long-range voyages the Royal Star has 12 staterooms that can accommodate up to 25 passengers with the support of a seven-member crew. Tankage includes 10,000 gallons of fuel and 1500 gallons of water. 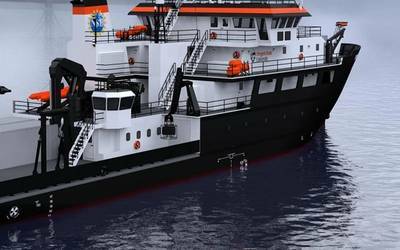 A pair of 100 kW gen sets keeps the vessels extensive freezing capacity and other amenities operating. On occasion the Inter-American Tropical Tuna Association and Mexicos Instituto Nacional de Pesca send scientists out on the Royal Star to tag tuna for research porpoises. Eighteen guest fishermen get to do the fishing to provide specimens for tagging. This takes place in the tropical waters off the Revilla Gigedo Islands some 240 miles (386 km) southwest of Cabo San Lucas on the southern tip of Baja California.